The genesis of 25kv overhead electrification began in the late 1960s on the West Coast Main Line, the 1980s for the East Anglian Main Line, and the East Coast Main Line in the late 1980s. Development took place in stages culminating in fully electrified lines from London to Scotland on both East and West Coast lines, and from London to Norwich. The introduction of these lines required the construction of new motive power. Initially five types were produced for the WCML, from which the second phase of loco design was developed, giving a higher level of reliability, as well as power output. These newer designs were applied to the Anglian services, but the ECML plans required an updated design, ostensibly for mixed traffic, but hardly ever used on anything other than express passenger services, for which their 140mph potential enabled a major recast of the timetable. The opening of the Channel Tunnel required a mixed traffic dual voltage locomotive, running on both 25kv and the Southern Region 750v third rail DC. 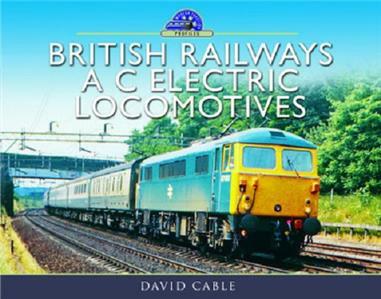 The locomotives are classified between 81 and 92 inclusive, and this book of photographs by David Cable covers all the classes in a variety of locations and duties.